Argan Oil has provided skin care magic for thousands of years, and Argan Oil Body Butter brings its anti-aging properties in a deep, rich moisturizing cream. Packed with vitamins A and E, anti-oxidants, Omega-6 fatty acids, and linoleic acid, this lotion has added shea butter for extra smoothness. 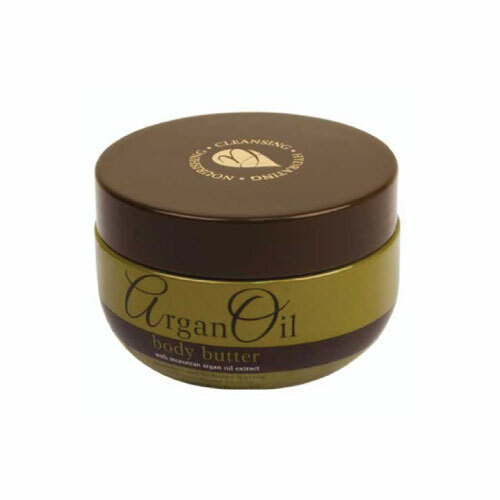 The Argan Oil Body Butter is a creamy body butter enriched with wild argan oil. Its luxurious texture melts into the skin seamlessly, leaving skin hydrated for 24 hours.Perfect for applying to the skin after a shower or a bath, in the morning or as a refresher before you to bed - the divinely rich consistency of Argan Oil Body Butter is gorgeous when massaged into your skin. This cream uses a blend of Argan oil, Shea butter and vitamin E to nourish and hydrate, leaving your skin feeling smooth and silky. Add it to your skin routine for an extra dose of moisture and care. So go on, treat yourself!